but at least that meant that we had empty tums for our packed lunches and were several euros better off! ‘Les Chèvres de la Saffrie’ (the Goat Farm to you and me) was again, one of the highlights of the trip. The children learned the French word for just about every bit of a goat’s anatomy, stroked them, brushed them, rode them and even danced with them. Cheese tasting resulted in what looked like the juvenile contenders for the Normandy Gurning Competition 2018, but we left happy, despite the all-pervading whiff of goat clinging to our clothes for days to come. The market at Villedieu-les-Poêles provided the children with an opportunity to buy a solid gold watch for five euros, a rabbit-faced balloon on a stick or a sackful of marshmallow ropes, but at least, they practised their French in the process. There is a Bell Foundry, too, in Villedieu, where an enthusiastic guide told us everything we needed to know about how to make an enormous bell. We were then able to exercise our budding musicality by whacking more giant bells with hammers – and suffering the consequences accordingly! Our day at Arromanches (Gold Beach on D Day) concluded the trip. We watched an excellent, dramatic film about war-time Normandy in the 360 degree cinema there – a fitting tribute and conclusion to our stay. 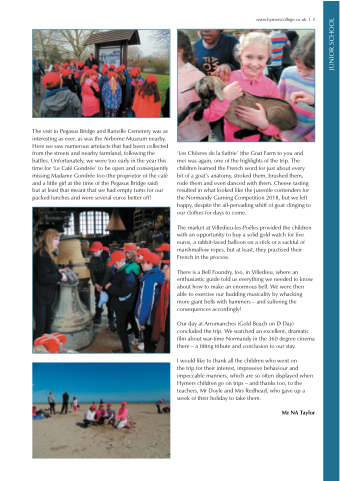 the trip for their interest, impressive behaviour and impeccable manners, which are so often displayed when Hymers children go on trips – and thanks too, to the teachers, Mr Doyle and Mrs Redhead, who gave up a week of their holiday to take them.